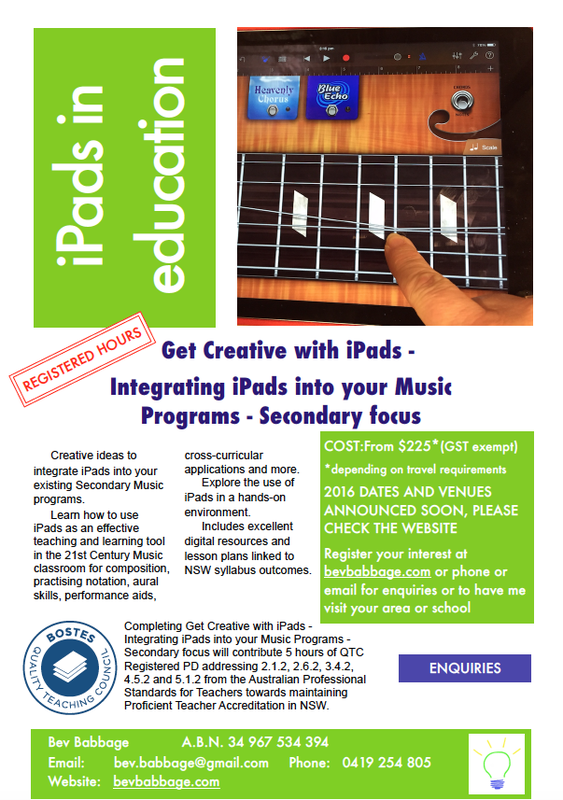 Creative ideas to integrate iPads into your existing Secondary Music programs. While there is a focus on Secondary students (including Mandatory and Elective courses), there are strategies and ideas that could be sued in Primary classes. Learn how to use iPads as an effective teaching and learning tool in the 21st Century classroom for composition, practising notation, aural skills, performance aids, cross-curricular applications and more. Explore the use of iPads in a hands-on environment. Includes excellent digital resources and lesson plans linked to NSW syllabus outcomes that have been tried and tested in the classroom. Completing Get Creative with iPads – Integrating iPads into your Music Programs – Secondary Focus will contribute 5 hours of NESA Registered PD addressing 2.1.2, 2.6.2, 3.4.2, 4.5.2 and 5.1.2 from the Australian Professional Standards for Teachers towards maintaining Proficient Teacher Accreditation in NSW. From $250 per person (GST exempt), depending on travel required. If your school prefers to pay be cheque, I can send an invoice. The course caters for all abilities, from beginners to more advanced. You will get take home digital resources to refer to when you need them. Some of the lesson ideas come with demonstration videos that take you through the process step-by-step.